Around this time of year, everyone’s minds turn to the mathematics of random distribution and Bayesian inference, although these terms are not normally used. This is all due to those tins or tubs or boxes of assorted chocolates, along with the fact that people have preferences among the chocolates on offer, and the problem that these preferences often overlap. 2) Since they don’t, are the chocolates at least fairly distributed between tins? In this experiment, I set out to answer these questions. I would simply buy a large number of tins of a particular kind, find the average chocolate distribution, then sort them into tubs of each type and sell these tubs on eBay with all proceeds going to charity in order to establish their value. Here in the UK there are a handful of big names that sell you a few delicious chocolates among a big tin of much less pleasant ones: Cadbury’s Roses, Cadbury’s Heroes, Nestlé’s Quality Street, and Mars’ Celebrations. Of these, the Roses seem to cause the fewest arguments. Heroes are a bit boring and odd. 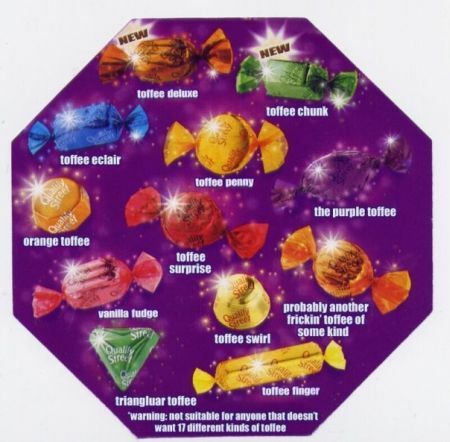 Quality Street cause the most trouble with just a few delicious options among a terrible array of toffee-based disappointments. This is literally how biased the Quality Street range is. Almost. Unfortunately there are twelve different chocolates in a tin of Quality Street, only two of which seem to be widely appreciated. I would probably have had to buy at least 13 tins, and I would be left with 10 very unpopular sweets to sell on eBay. Celebrations were the most promising. There are just 8 types, all of which are quite acceptable, but some of which are nonetheless noticeably more delicious. So over the course of a week I bought 9 tubs of Celebrations from three different supermarkets, the idea being I would have good odds of being able to make up 8 tubs of each type. I cleaned out three containers, donned a pair of brand new rubber gloves for hygiene (even though the chocolates are individually sealed), and began sorting and counting. My sorting and counting system. This process took approximately 90 minutes, although would have been a good deal faster if I hadn’t been carefully counting as I went along, and hadn’t been distracted by Robert Llewellyn telling me how buildings are demolished. It rapidly became apparent that I had made a critical mistake. You can see the complete results in this Google docs spreadsheet. This presented a problem. In order to run a fair test on eBay, I needed each tub to have an equal number of chocolates, at least the same as the standard amount (which is, on average, 106.3). The solution I settled on was that since (presumably) the Galaxy chocolates have a similar appeal, and there were so few of each type, I would bundle them together. In this way I was able to make up 9 tubs of 100 of a particular type, with a random additional 10 of the leftovers added so that there were more than the usual amount of chocolates, and also to make the end result look a bit more like some kind of hilariously improbable random sorting. Of course, I can only put up one tub of each type for it to be a fair test. I will auction the remaining tubs at a later date. I will give the results of the auctions in the next post. This entry was posted in experiment and tagged bounty, caramel, celebrations, distribution, ebay, experiment, fair, galaxy, malteasers, maltesers, mars, milky way, snickers, teasers, truffle. Bookmark the permalink.